Mobile devices outnumber desktop and laptop computers three to one worldwide, yet little information is available for designing and developing mobile applications. Mobile Design and Development fills that void with practical guidelines, standards, techniques, and best practices for building mobile products from start to finish. 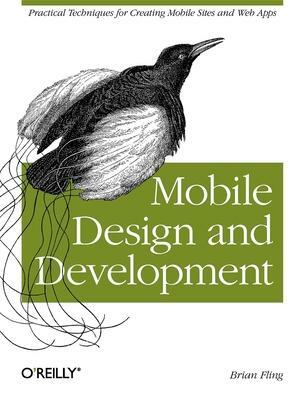 With this book, you'll learn basic design and development principles for all mobile devices and platforms. You'll also explore the more advanced capabilities of the mobile web, including markup, advanced styling techniques, and mobile Ajax. If you're a web designer, web developer, information architect, product manager, usability professional, content publisher, or an entrepreneur new to the mobile web, Mobile Design and Development provides you with the knowledge you need to work with this rapidly developing technology. Brian Fling has been working in both the mobile and web industries for close to a decade as an entrepreneur, consultant and employee. Brian has worked with everyone from Fortune 50 brands to small startups navigate and make the most of the mobile space. After spending years working with well funded mobile companies that have failed miserably, he has gained a unique perspective on the industry. Avoiding the hype and jargon that plagues the business, Brian seeks to educate people on the tried and true principles and techniques to building cost effective mobile experiences. Brian is a frequent speaker and author on the issues on mobile design, the mobile web and mobile user experience. He was the primary author of the free dotMobi Mobile Web Developer's Guide, downloaded thousands of times over. He is currently writing a book for O'Reilly entitled Mobile Design & Development due out later this year.